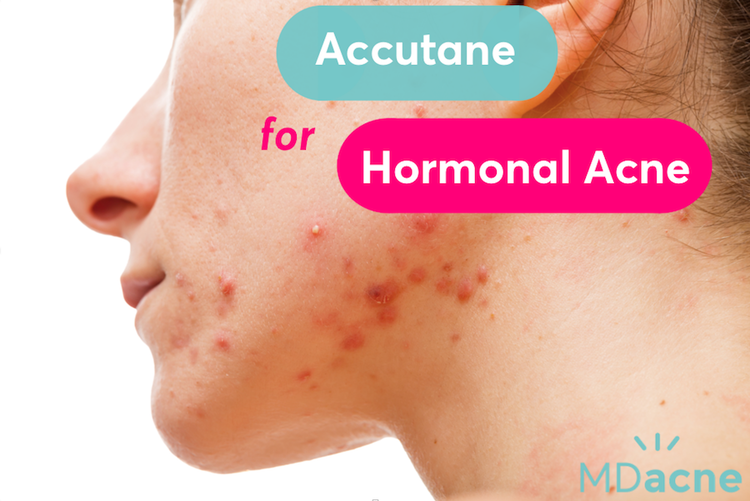 Does Accutane work for hormonal acne? For people with hormonal acne, the skin's sebaceous glands (aka oil glands) tend to be more sensitive to certain hormonal—particualrly what are referred to as “androgens” like testosterone as well as cortisol. Therefore, an imbalance in these hormones—caused by different factors such as stress, sleep, diet, environmental toxins, and certain medications—can lead to more (and more severe) breakouts. Accutane (Isotretinoin - a derivative of vitamin a) is considered the single most effective oral medication for the treatment and prevention of acne and works by normalizing the activity of the sebaceous glands. Therefore Accutane is typically very effective in the treatment of hormonal acne—even the most severe cases of cystic acne and adult acne. Accutane is a very intense drug with many potential (sometimes severe) side effects and is often considered a "last resort" treatment. As with any type of acne, It is always best to start with an effective topical acne treatment using acne medications (such as benzoyl peroxide, salicylic acid, and/or topical retinoids such as Retin-A) to help cleanse the skin and balance oil production from the outside. That being said, while people with hormonal acne can typically see at least some (or significant) improvement with the right skin care products, the addition of oral medication is often necessary to achieve completely clear skin. There are several other oral medications (acne drugs) that can be considered and implemented—alongside a good skincare routine—to help control hormonal acne before Accutane. One of the risks associated with Accutane is birth defects if taken while pregnant. Therefore, women considering Accutane are legally required to be on some form of birth control to prevent a (potentially dangerous) pregnancy. What is interesting is that certain hormonal birth control pills (i.e. oral contraceptives) can also significantly improve hormonal acne for some women by balancing the hormones and improving the activity of the sebaceous glands. Therefore, it may be advisable for some women to start by implementing a hormonal contraceptive pill alone to see if that can help control their acne without the need to add Accutane as well. For women with persistent hormonal acne that does not subside with topical treatments, hormonal contraceptives, or other oral medications (such as Spironolactone and Antibiotics), it may be advisable to consult with your physician about adding Accutane to your acne treatment.